Should I be Running a 10k PB In a Half-Marathon? 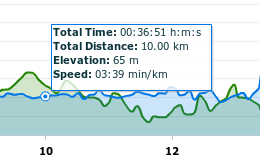 That folks is an all time PB for 10km for me, by one second, and it has occurred in the middle of a half-marathon. Now I admit I started yesterday's run a little fast, but I don't think I did it that fast. I guess I did. It certainly means a sub-37 min 10km race is definitely on the cards next year. Who knows, maybe I can dip below 36 mins. Now that would be amazing.